In their quest to stay relevant, Facebook has “borrowed” many features from its social network rivals over the years. Their answer to Twitter’s Periscope acquisition was Facebook Live. Facebook even drew inspiration from Slack, a collaboration chat tool, when they introduced reactions to its Messenger app. But of all its competitors, Snapchat has been on Facebook’s radar for a long time, thanks to its popularity amongst Millennials and Gen Z. The Facebook App roll-out takes some of Snapchat’s core features, and incorporates them seamlessly into Facebook’s growing feature repertoire. This article will explain Facebook’s latest app update, and the reasons behind Facebook’s adoption of Snapchat’s most popular features. *You will need to update your Facebook app to have access to these features. 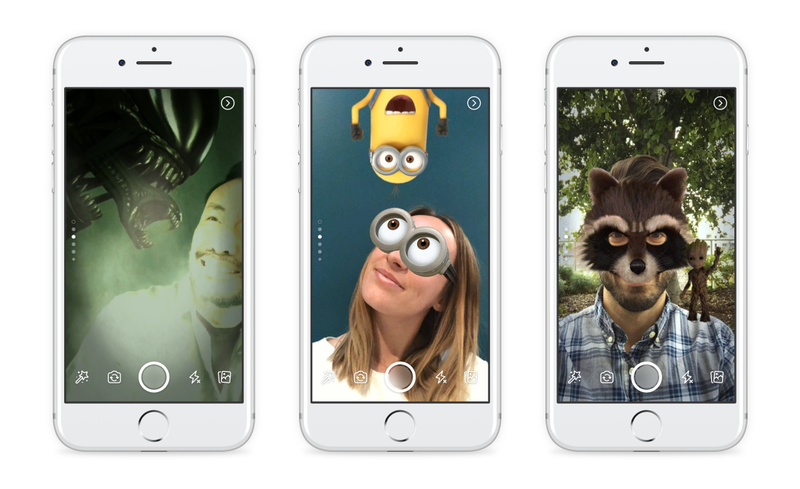 Facebook launched a brand new in-app camera that’s full of filters, effects and masks. To use this feature on your iOS or Android device, you can tap on the camera icon on the top left corner of the Facebook app or swipe right from News Feed to try out the new in-app camera. Following in the footsteps of Instagram Stories, Facebook has updated its app to include the disappearing content feature. Facebook users will now be able to share multiple photos, and videos above the News Feed. Direct allows the user to share photos and videos with specific people for a limited period of time. It’s basically Stories but the content is not public. It can also only be viewed once. (A throwback to Snapchat’s early days), and once the conversation on the photo/video ends the content will disappear from Direct. Why should users adopt Facebook Stories over Instagram or Snapchat stories? Hayes answered, “It depends on how they use each app, and who their network is on each app.” After all, each network has its different users. According to Pew Research demographics, only 13% of 50-64 year olds use Instagram, whereas 61% use Facebook. That means 18-29 year olds might be more likely to share content for their friends on Instagram, and then family-appropriate content on Facebook. As we can see from the chart above, Facebook is the most-widely used social network, and its user base broadly represents the population as a whole. That means the Snapchat features familiar to younger users will be very new to many Facebook users. So why is Facebook mimicking Snapchat? Will Facebook’s users like Snapchat’s features? There’s a chance users who are not familiar with Snapchat won’t take to Facebook’s updates. But given that almost all of Snapchat, and Instagram’s users are also on Facebook it may put the original timed-share network in jeopardy. We’ll have to wait and see!